« Who Let THAT Guy in Here? Note: While Fatty is cycling away in France with Andy FREAKING Hampsten, Paul Guyot is guest blogging. Okay, great. We know we’re nifty folk. But I want to share an experience with you dear house guests of Fatty, that will reveal why PRO cyclists are the coolest of the cool. Though, I’m not sure about the one dude who hit the other dude with the wheel last year. By the way, why is houseguest one word, but house guests is two? And since we’re on this train, why do people spell “yea” Y-A-Y? It’s not like it’s saving you any time. Still three letters to write or type. In fact, the E and A are closer together on the keyboard than the A and Y – thus, spelling it the proper way will actually save you precious nanoseconds over time. Team RadioShack is awesome. They’re all friends of our host, and there’s good reason. RadioShack rocks. Bruyneel, well, you’ve seen it around here, the guy’s pretty freaking nifty. That all changed on Tuesday when – by helping out BIKE MS and the National MS Society – I was able to secure a spot for myself and my son among the 100 VIP’s who got to meet, hang out with, Q&A with, and ride with members of the Garmin-Cervelo pro cycling team. Perhaps you’ve heard of them? They won a little bimble know as Pairs-Roubaix, had a truly amazing Tour de France, won just about every team competition out there, and are crushing it in Spain as we type. Oh, they also had 2 of the top 4 finishers at the Tour of Colorado, er… excuse me, the USA Pro Cycling Challenge last week. And with that we are off on our four-hour drive to meet and ride with the boys of Garmin-Cervelo. My son’s second favorite cycling team. We arrive an hour and a half early because… my son is 8-years-old. But just as I am thinking up creative ways to kill time, my son sees the team approaching, sporting jeans, Polos and non-cycling sunglasses. Christian Vande Velde engages my son, they have a brief exchange, and then I say, “Jack, do you know who you’re talking to?” My son looks between me and Christian with knitted brow. I tell him it’s Christian Vande Velde and, right there on the steps of the Garmin International headquarters, we all witness an actual human mind being blown. How many times have we all heard some version of It’ll blow your mind? Let me just say that, until you actually see it, you cannot imagine the sheer force and beauty of it. Over the next hour, before this event has even officially started, the Garmin-Cervelo riders are not hiding out in their bus, they are not huddled in a corner making inside-jokes to each other while trying to avoid eye contact with any non-Garmin types. No. They are sitting around with my little boy engaging him in all sorts of conversations. Daniel Lloyd is showing him video of his son on a bike; Ryder Hesjedal is discussing how to become a better descender – “Practice. And keep pushing the limit.” “What’s that mean?” “You gotta crash a few times.“; Even Director-Sportif Jonathan Vaughters is talking to Jack like he’s one of the team. Vande Velde blowing his mind. 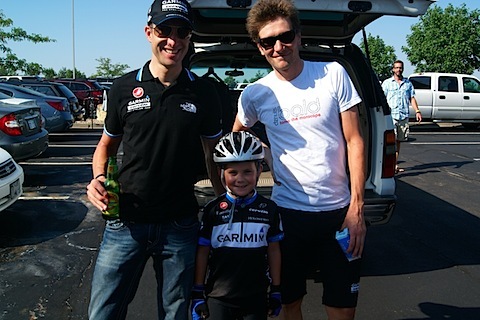 Vaughters telling my son the Garmin junior race program starts at age 12, but that Jack could give him a call at age 9. During the Q&A Tommy Danielson telling us that during the big sprint finishes on stages, he hits about 495-500 watts… for 95th place. The complete physiological change that took place in my son after Tommy D. asked if he’d ride in with him. Watching from behind as my son rode in, chatting with Tommy Danielson – his favorite Garmin rider – because Tommy D. asked Jack to ride in with him. Tommy D. Tweeting a photo of himself and Jack after the ride. My son asking Tommy D. where he could buy the kind of water bottle Tommy D. had on his bike, and Tommy saying “Right here” and giving Jack his water bottle. How each rider and the Director treated my son with respect, interest and genuine pleasure despite the fact they were all probably completely exhausted and wanted nothing more than to get this glad-handing over with and get home. A HUGE THANK YOU TO: Christian Vande Velde, Peter Stetina, Tom Petersen, Danny Summerhill, Dave Zabriskie, Daniel Lloyd, Ryder Hesjedal, Tommy Danielson, and Jonathan Vaughters. And very special thanks to Jake Jacobson of Garmin International who did an amazing job. Wow, that is so cool! I can only hope my kids show as much enthusiasm for cycling as Jack, and that we can have an opportunity to experience the heroes-of-the-day in a few years time! touching story, thanks for writing it. Wow, amazing and so cute! Way cool. Treasure those memories always. Awesome! Jack is too funny! Off-topic, but any Fatties riding the Granite State Wheelmen Seacoast Century in NH/ME the weekend of 9/24-25? If so, email me at deepbrook@gmail.com. Too funny. Great post. It’s awesome to see youth who are this passionate about something…especially cycling. That IS the coolest thing ever. Might have to make them MY #1 team too – they were top 3. Love that they appreciate fans and mere mortals. Your son is absolutely adorable!! Way too cool a story, tell Jack Garmin has just become my favorite team too. Oh and his had is a cool guy too, Fatty made a good choice. Awesome, thanks for sharing! I wish I could start every morning with a heartwarming story! Nice. I’m jealous of a freakin’ 8-year-old. Very sweet! Thanks for sharing. And you’re doing an awesome job filling in for Fatty. Very cool. Cyclists really are the best. What a fabulous post! And your son is sooooo cute. How does he know so much about cycling – he must have picked it up from his dad! AWW! That was an awesome story! We went to Rabbit Ears Pass this past weekend to watch the first KOM on Stage 5 and when George Hincapie went by, I shrieked his name. I can’t even replicate the sound that came out of me. I’m impressed your son was so calm. And I agree…you are doing an awesome job filling in. Fatty who? Thank you so much for the heartwarming post. I am with Evia, I think Garmin-Cervelo is my favorite team now too. I have always loved Dave Z., but the “Bucky” comment really sealed the deal- and they do have the best kit. That pic of Jack with Tommy D in matching kits is just about the cutest thing ever. You are clearly an awesome dad – as Jack is clearly such an awesome kid. Great post. Looks like you both had an amazing time. I work in that building where you started the ride, but couldn’t go on the ride due to a schedule conflict. Just curious, you said it was a 4 hour drive….where from? Looks like there are some good trails in your area…. Yeah I was on that ride too and got to ride with Danny Summerhill. Garmin did put on a first class event for fans of the team. I am super lcky to live about 3 miles from the HQ and those are my nrmal training routes. GREAT post! Awesome experience. Jack knows jack about pro cycling, that’s for sure. I’m also w/ Evie. So cool that the G-C guys were so engaged. Awesome story, I hope some day when I have kids that they are as passionate about cycling as your son is! Thank you for sharing! Glad to hear the back story that went with the Tweet Picture yesterday. Almost ran out to Garmin HQ myself just to see the guys. They are always so nice and it has been my experience from multiple races that not only are the Garmin guys that way but all procyclists almost to a man are the same way, just a great group of folks and always fun to be around. Very cool post and great photos. Thanks for sharing. What a memorable occasion for your son. Thanks for sharing. Thanks, all. It was an amazing experience mostly because there is nothing like watching your kids experiencing pure joy. We also learned a great lesson about never giving up, and how sometimes things might seem bad but there’s a reason for everything – Jack realized that if we had not had to abandon, then he would not have gotten to ride in with Tommy D.
He slept with the water bottle. Awesome story, awesomely written-up! Yay [couldn't resist] for Jack! 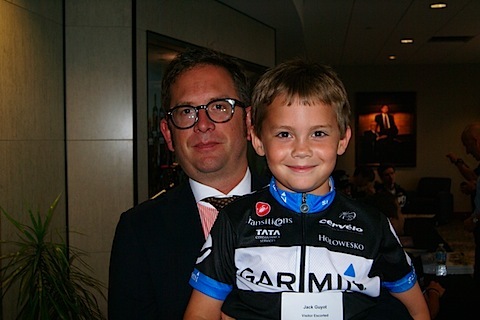 Where did Jack get the sweet kid-sized Garmin jersey? I know two little girls who might need their own . . . Awesome post, awesome story and I think after reading htis Garmin may now be my favorite team as well…. As the mom of an almost 7 y/o boy, I am genuninely thrilled for you that Jack had a once in a lifetime day. That said, no one pro cycling team is more supremely awesome, fabulous, cute, sweet and wonderful than Team Radio Shack. There, I said it. Flame away if you must, Jack and dad, but Radio Shack RULES! I have a problem….. After this post I think fatty is my second favorite cycling super megablogger. I have to go ask my dad if that’s ok.
What a great story! That is one cute kid! Here’s to rooting Bucky on in a few years!! AWESOME story! You did a great job of telling it. What an amazing experience for your son. I think Garmin just became my favorite team, too! HA! I love it. Your kid rules, dude. I hope you know that’s in part because you are an awesome dad. Thanks for sharing… Loving the guest posts. also, I almost ruined my laptop when I spit water all over it when you told us all that he slept with the bottle. that’s the cutest/funniest thing I’ve heard this week. Jack – I know how you feel! (Except Garmin has always been my number 1). I made a big Argyle banner and took it to the TdF last year. We took it to 3 stages in the Pyrenees and to Paris. My mind got blown when, in Paris, the Garmin bus stopped and the support team got out and handed out some Garmin goodies to us and everyone around us. I like to think it was to acknowledge my awesome banner! Not only are the riders great – so is everyone on the team! Argyle is #1!! Your kid is cute as a button. And that’s such a sweet story that I nearly cried. Kudos to Garmin-Cervelo for being awesome people as well as cyclists! What a great post! Jack is so adorable, and so funny! What a great read to start the day! So good! So well written, funny, insightful, I think your son should have a article here and there. Very cool! Now those are pro athletes worth meeting. best story every! I think Garmin is now my number on team also! Absolutely awesome!! What a terrific day, and it’s nice to know that there are professional athletes who are actually good role models. It’s wonderful to hear that they spent so much time with your son. And like everyone else said, he is one cute kid! What a sweet sweet story and your son is sooo cute. I have one the same age and it is such a cute age. 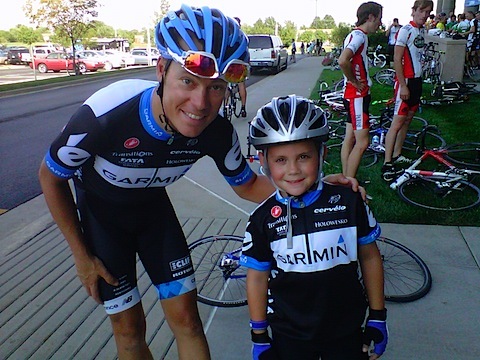 Amazing post … So glad that your son got to experience how true athletes treat their fans … Clearly they appreciate the fans and especially the young ones … Great job on the blog and great job to Garmin-Cervelo for keeping it real and making a positive impression on a little boy … and his dad. Great story. Good thing for me is that I already liked Garmin Cervelo, so I don’t have to reorder my opinions. Really great story, though. My son’s too young (four) to have any real heroes outside of the family, but I’d love to be able to do something like that for him when he’s old enough to care. Although at the moment, I think my son’s idols would be more along the lines of famous paleontologists and museum curators than athletes. He’s certain that that’s what he wants to be when he grows up. Also, your kid can do a 20 mile ride at 8? Your kid is awesome. Wow that was an awesome story. Your son is a truly lucky little man. 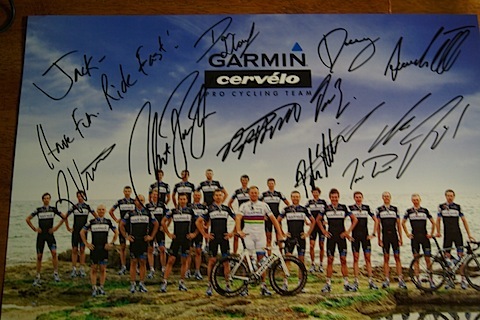 It is great to hear that the Garmin Cervelo team are good guys. Way to go Paul, great opportunity for your son (and yourself). My daughter got to ride with a Team Jellybelly rider at 8 at Best Buddies Hearst Castle. That was then her favorite team. But as Wife#1 says…Radioshack rules! On the plus side you and your son can dress up for Halloween in sideburns, argyle, and designer glasses…. it always scares me. Great story!! It is so great to hear about the good side of professional cycling. Go Jack!! I can see him riding in the TDF in about 14 years. Thanks for sharing this experience Paul. I agree 100%! Went to the Garmin team bus after stage 6 of the Tour of Colorado :) and have to say that those riders are amazing! They weren’t hiding in their bus like so many others, they were out signing autographs, posing for pictures and talking with the fans. Got autographs from all the riders and my picture with Dave Z. and Danny S.!!!!! It was the highlight of the month for me and my friend! Absolutely LOVE this team!!! Great post, Paul!! You and your son are so lucky…. and I love those pictures. Jack is a real cutie, and he may have the chops to make it big with Garmin! GREAT post!! Terrific little guy! Love the pictures! Haha! That was awesome! “I bet Chris Horner would be mad” Classic! Nice!!! Enjoy riding with him while you can, because in a couple years he’ll be flying! Thanks for sharing your story and photos. Great kid that Bucky, can’t wait to read the post when he gets his first PRO contract. 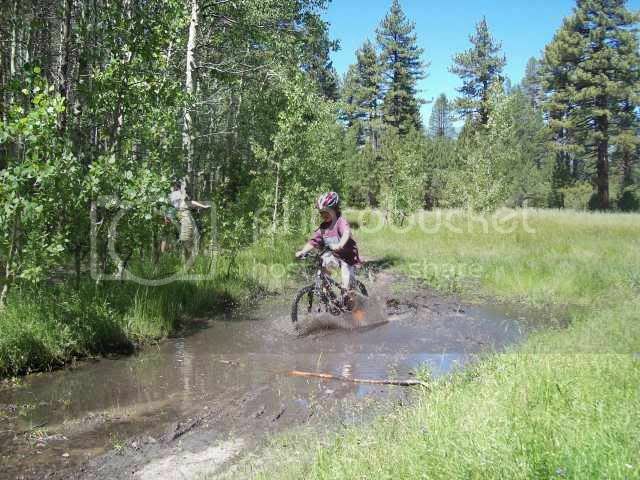 Here he is training for Leadville…. Fantastic post, Paul. I agree with Jacob 20 miles for an 8 year old is pretty impressive. Also his in-depth knowledge of cycling is equally impressive. Levi maybe you need to invite Jack to a U8 training camp. That way you could sign him before Jonathan dose. I love the digression keep it coming. Well I mayself got there very early, it was just Jack his dad and me. I asked Jack who was his favorite rider and of course he said Tommy D. Jack went on to say that he was going to race the Tour De France and win it. What a remarkable young man Jack is. I should have got Jack’s autograph what was I thinking. That sure put a smile on my face! Awesome story, thoroughly enjoyed reading that. This is a great story and an example of a great bunch of guys. It wouldn’t have mattered a fiddler’s damn what jersey they were wearing. WOW! What a great father-son relationship you share. A future Tour de France winner for sure. And, Jack, don’t worry honey, I’m sure Chris will forgive you and will still be willing to be your very best friend along with Levi, the RadioShack guys AND Tommy D and the rest of the Garmin-Cervelo guys. There’s enough love in this cycling world to go around and I’m sure anyone would be willing to share with such a fantastic kid as you, Bucky! Have to agree with Wife #1 though, RadioShack has had my heart since they were U.S. Postal, but Garmin-Cervelo captured a big piece of it with the Argyle pattern that Jonathan Vaughters brought that very first year. YAY for you Bucky, I look forward to your future. Maybe YOU can be Captain America someday. You’re a terrific kid Jack. That was an awesome story. It’s great when PROs go out of their way to be regular Joes. They probably like it that way. My son and I share our hobby of riding. He started at 6 or 7 he’s now 29. We have raced together as well. He is a fulltime roadie now and there is no way the old man can keep up! My technical trail bike handling is still better. Cool article – my daughter’s favorite rider is Tyler because she got his autograph after the KC stage of the tour of Missouri (second year it was held) and Tyler finished behind Cav, but he was cool and Cav wouldn’t talk to her …. Hey Jack, what size/type of bike are you riding? Do they make a carbon road bike for kids yet? My son is 9 and would love to ride with you in CO.
Wow, what a great story. I wish I had that kind of experience with pro racers when I was Jack’s age. Tommy D is a great role model! Jack’s had a great day and he’s definitely made mine too with this wonderful story. Thank you so much for sharing all this with us! This is exactly why procyslists are the coolest guys on earth. THANK YOU. I hope Jack can keep that passion for cycling alive and he’ll be able to go a long way! Well, Levi responded but Chris Horner didn’t. I guess maybe he’s still kinda mad. Jack: You made the right call. Team RS is supposed to be kaput and Levi is leaving for the new Omega-QuickStep team! Way cool! Spend a few munutes with a kid and it can change his life. Or hey, spending a few MINUTES with a kids is even better! What a great story!! Had to keep repeating ” grown men dont cry!” Garmin Is my favorite team too Jack. What a great team to make a young mans day. I think this was my all time favorite Fatty post. I know it was. ADORABLE. My son in Denver a bike fanatic and Tri-athlete sent me this story. IT is so heartwarming. These Pro Cyclists are bringing their sport to the people and it’s growing like Topsy. What great role models they make for the young athletes and us old athletes. As a KC area guy, I’m glad you guys had a great time in our neck of the woods. I sure do miss the Tour of Missouri. Was so great to have a local event of that size. My little guy is still in training… very early training. 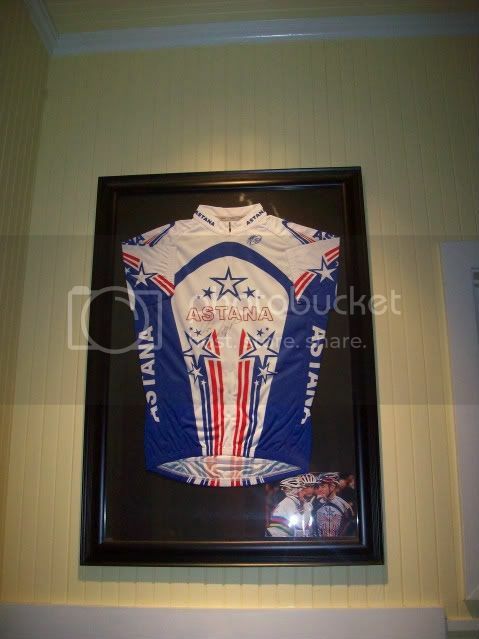 Jack – Garmin was the nicest team at the 2008 Tour when I was there. CVV signed my jersey and Ryder signed my green hand. In Paris at the last stage, I waived my Slipsteam jersey at the Garmin bus while it was waiting to park. Someone waved back and then got out of the bus, walked across the Rue de Rivoli and handed me a Garmin hat with the brand new log. My coolest moment ever. My husband wrote a nice story about it and sent it to Slipstream. They selected it as a Fangyle winning story one day and sent me socks. Coolest team. Jack- When you are riding for (or probably the directer of) Garmin-Cervelo I bet you will be are as cool to my grand kids as these guys were to you! Great story! Those memories and experiences will forever be remembered by your son. Lovely story, an experience to remember always. “Yea” means yes, as in old English, and goes along with “Yeah”. “Yay” comes from “hooray”. Wow, that was heartwarming. YOU and your son will never forget that experience. Crazy story! Glad Bucky enjoyed it. Hands down my favorite FC guest post of all time. Great guest post, Paul. Those Garmin guys sure know how to win people’s hearts. I’m kind of jealous, too. Fatty, don’t worry we still miss you. If there are many more posts like this you may have to keep Paul on for a once a week post to keep the masses happy, though. To someone’s comment: his bike is a Trek KDR 1000; a 24″ road bike. They don’t make them anymore. Felt makes a great kids road bike. As to the “Yea” and “Yay” of it all. Unfortunately, you are all wrong. Yea does not come from yes – “Yeah” comes from Yes. Yea comes from “yea” as in “yea or nay” – Yay does not come from Hooray – it comes from lazy writing and spelling due to technology and entitlement among other things. And just to really annoy you – “impactful” is not a word. The correct word is impactive. But again, our society assumes if enough people spell or use a word a certain way, it just becomes correct. I don’t subscribe to that. Lastly, apologies to those of you who thought Fatty had posted this. Apparently, he’s been dealing with crazy emails about the 8-year-old son none of us knew he had. Pshaw. Yea should be prononced like yeah; if you want to say something rhyming with splay you’re going to be saying yay. What a lucky boy! What a great team! What an amazing kid for 8 years old! Thanks for the great story! Geez, I would have acted just like Jack, and I’m 54. Something tells me that kid is a bike racer for life now. Love it. I think Garmin might be my favorite team now. Jack will remember that for the rest of his life. Paul, Cool post I enjoyed reading it. Great stuff – seeing the inspiration passed along! According to the Oxford English dictionary, Yay would be the only correct spelling for an exclamation of approval or encouragement. If you are looking for a synonym of yes, then yeah would be appropriate, or perhaps yea if you are a member of Congress. Great story, and great little racer dude. Made my day. Great post! Jack is so adorable, too. I hope to continue reading about his cycling exploits in the years to come. What an incredibly mature perspective for an eight-year-old. I agree that yay is not “correct.” I agree that impactful was a word dreamed up by marketers. But you are wrong when you say yea does not come from yes. Note: Yeah is a variant of yea, an informal variant, but a variant nonetheless. Not sure what you think nay means, but it means no or negative. You vote yea or nay, an affirmative or negative vote. O.E. gea (W.Saxon), ge (Anglian) “so, yes,” an affirmative word in Germanic, cognate with Ger., Dan., Norw., Swed. ja. 1. yes (used in affirmation or assent). 2. indeed: Yea, and he did come. 3. not only this but even: a good, yea, a noble man. Yay does not come from Hooray – it comes from lazy writing and spelling due to technology and entitlement among other things. I guess you could have discussed the use of aye (used in British Parliament) vs. yea (used in U.S. Congress). I really wish you had thrown in the proper use of "penultimate" in your post as I hear it misused so often. Yea! Maybe Jack could give a little guest post while Fatty is gone? What harm could there be in that? Just saying. 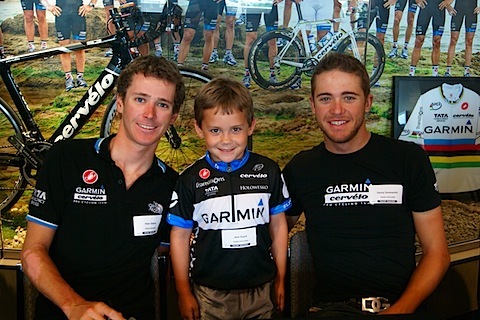 Can I just back up how great the Garmin boys are, at his year’s Tour Down Under here in Adelaide we got to meet Tyler Farrar and Julian Dean, Julian chatted with my eldest asking if he rode and how he had kids about the same age as mine and how much he missed them when he was away. Tyler was just so encouraging and great with the kids as well. Just really nice approachable folks, not your typical arrogant sporting star who gives you a grunt and some illegible scrawl for an autograph. And to add why do flammable and inflammable meant he same thing???? I’m confuzzled… earlier today reading through comments, I saw a few replies at the bottom of specific comments from (allegedly) Fatty – in his style anyway: italics, short and very witty in that inimitable, self-deprecating manner of his… but now they are gone. Paul, thank you, thank you for the discussion about “impactful”!!! (I’ll just presume a discussion of “impacted”; aarghhh). Maybe you can give us a few words on the not-so-new “apprishiate” that’s infiltrated the language. Makes be berserk. Oh, and what ever happened to the first ‘l’ in vulnerable, and to the second syllable, altogether, in that word? Maybe the people who use that have /gulp/ i-s-s-u-e-s.
Jack is the coolest. You’re clearly doing plenty right. What a fabulous day out for him, and for you. Love the story and the telling. Thanks. A little word about the “godly” move to BMC – the main reason for moving was perhaps the lack of respect he was getting from a certain mr Vaughters. Thors main goal each season, apart from TdF, is the mentioned Paris – Roubaix. For the second year in a row he was promised full support from his team, and for the second year in a row one of them went in a breakaway blocking Thor from going for the win. Paris – Roubaix is the ONLY race he is asking for full support in! A shame for Garmin, they are much weaker without Thor. Remember TdF: 7 days in yellow, 2 breakaway wins (gaining time towards the “best team”), great TTT and a super lead-out for Farrars win. Put in a Haussler or any other rider instead and make your own opinion on how good their TdF would have been..
BMC are looking really strong next year though! Don’t be surprised if they win ALL the spring classics. Having the two best classic riders in the world on the same team can not be a bad thing! Great guest post! What a neat experience — thank you for sharing. Cyclists really are unique among the world of pro athletes — they work harder, make less, and are just damn nicer than pretty much anyone else out there. “He slept with the water bottle.” Totally killed me – because it’s funny, because the mental image of the little dude curled up with his water bottle is freaking adorable (my 3yo nephew sleeps with his favorite John Deere toy), and because I would probably have done the same thing. What a great experience for Jack — a memory he’s going to treasure for life, and the fact that Dad Made This Happen is going to be a big part of what makes the memory special. What a great read that was – thanks for posting in Fatty’s abscence. I would like to have seen the look on the Runners face when Fatty started getting all those e-mails about a mystery eight year old son! Only one problem – how are you going to top that when the next special Father \ Son time comes around! Is there room in Jack’s room for you to adopt me? Now that is an awesome story. It must be great to be Jack. That was a great story Paul. Your son’s comment about Chis Horner being mad kept a smile on my face all day long. I’m 43 – and after reading that, GC is MY favorite team now! What a class act. What a great day for your son – that’s a fantastic read.